People who develop bacterial infections of the ear, skin, lungs, urinary tract or sinuses may experience relief from uncomfortable symptoms following treatment with Augmentin. Augmentin is a prescription medication that contains two active ingredients: amoxicillin and clauvulanate potassium. People who are allergic to any form of cephalosporin antibiotics or penicillin should not take Augmentin due to the risk of developing allergy symptoms, PDRhealth advises. Allergy symptoms of Augmentin can be life-threatening and affected patients require emergency medical care. Patients who are hypersensitive to Augmentin can develop a severe allergic reaction called anaphylaxis immediately after taking a dose of this medication. Hypersensitive patients can notice the appearance of red, swollen welts called hives across their body, Drugs.com warns. Skin hives can be uncomfortable and may begin to itch profusely. Sudden swelling of the throat, tongue, lips or face can occur as an allergy symptom of Augmentin. An allergic patient's facial features can appear abnormally enlarged or puffy. A swollen tongue or throat can cause hypersensitive patients to slur their speech or have difficulty swallowing or breathing normally. The swollen skin region can also appear red or inflamed and may be tender to the touch. An allergy to Augmentin can cause severe breathing difficulties in affected patients. Swelling within the throat or airways can interfere with a patient's ability to inhale or exhale normally. 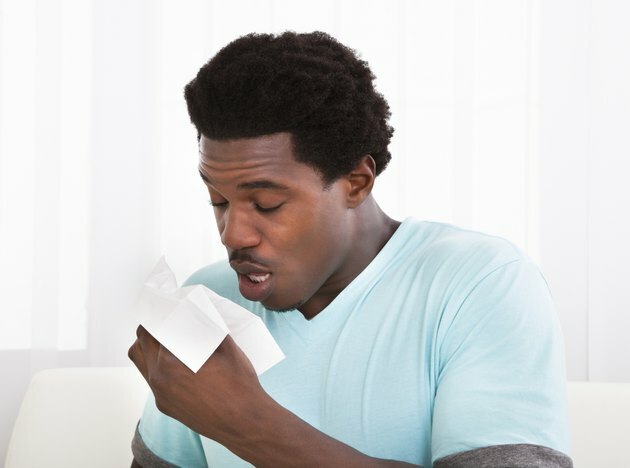 Consequently, allergic patients can develop symptoms of cough, wheezing or unusually high-pitched breathing, MedlinePlus explains. Breathing difficulties can also contribute to lightheadedness, dizziness or fainting in patients allergic to Augmentin. After taking a dose of Augmentin, hypersensitive patients can experience nausea or vomiting as allergy symptoms. Certain patients can also develop diarrhea, which may contribute to abdominal cramping or bloating. These allergy symptoms of Augmentin typically arise in patients within a few minutes of treatment. Patients who are allergic to Augmentin can appear unusually confused or anxious after taking a dose of this medication, MedlinePlus warns. These symptoms typically occur in conjunction with alternate anaphylaxis symptoms, such as breathing difficulties or dizziness.